Proof Leia Is Rey's Real Mom in Star Wars: The Last Jedi? Carrie Fisher's daughter, Billie Lourd, recently dropped a bombshell during an interview with Ellen DeGeneres by saying that J.J. Abrams originally had her audition for the part of Rey in The Force Awakens. 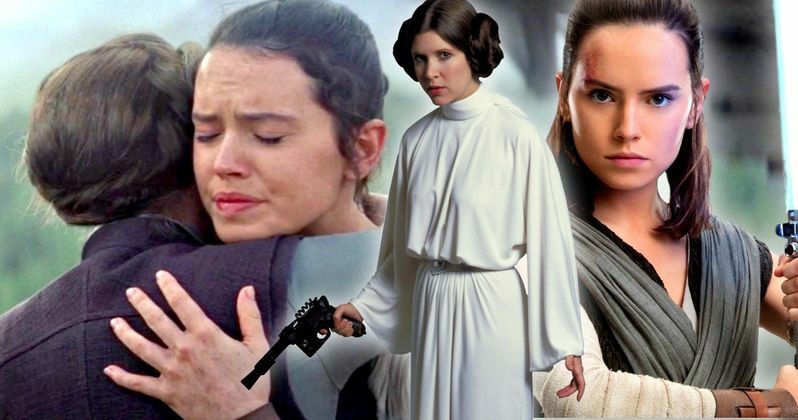 There has been a lot of mystery and speculation about who Rey's real parents could be and how it fits into the Star Wars universe, but Abrams' initial idea to cast Fisher's daughter could have bigger implications than originally thought. It has been rumored that we may get insight into Rey's parents in Star Wars: The Last Jedi and that it will help her character to move forward. Could Billie Lourd's big reveal be actual proof that Rey is Princess Leia's daughter? At the time of The Force Awakens, Billie Lourd had zero acting experience, so right off the bat, the notion of her trying out for the lead role seems a bit fishy. But maybe Abrams was setting up a larger part of the narrative from behind the scenes by casting Carrie Fisher's real-life daughter as her onscreen daughter as well. Ultimately, the role went to Daisy Ridley, who arguably looks a bit more like Fisher than Lourd does. Abrams could have scrapped the whole idea ahead of time out of fear that fans would solve the mystery of Rey's parents too soon from casting Lourd as Rey. The Lourd interview comes to us via The Ellen Show YouTube channel and the young actress talked about Abrams choice of Daisy Ridley taking over the role. She explains. "He ended up finding Daisy Ridley. Who's an incredible actress, so talented. (I ended up with a) tiny role with a couple of lines." Daisy Ridley was brought in to take on the role and the rest is history. Ridley was quoted as saying that Rey's parents are "obvious" a year after The Force Awakens had been out, but she could have very well been teasing fans who are trying to solve the mystery. Another clue pointing in that direction is that Leia hugs Rey, who is a stranger, after the death of Han Solo in The Force Awakens. Why wouldn't she go over and hug Chewie during that time? There have been plenty of rumors suggesting who Rey's parents could be, all the way from Obi-Wan Kenobi to Emilia Clarke's Kura character in the upcoming Han Solo movie and everything in between. Many believe that she could be Luke Skywalker's daughter, but Leia being her mother just makes the most sense. Rey is in tune with the Force and became familiar with her new-found powers rather quickly, so it makes sense that she would be related to Leia and Luke as well as Kylo Ren. Though Billie Lourd did not offer up any other news about The Last Jedi, we do know that Carrie Fisher's Leia character gets an epic send-off. Maybe the reveal will come at the end of the movie and adds to how the spirit of Leia will live forever in the Star Wars galaxy. This is all speculation at this point, but J.J. Abrams and Billie Lourd may have let a big spoiler out about The Last Jedi and Rey's parents. We'll have to wait until December 15th to find out, but in the meantime, check out Lourd's interview on The Ellen Show below.